Professor Emeritus of Geography, Selwa was the longest serving Chair of a CCU department (Politics and Geography). He also served as athletic director and head baseball coach and men's basketball coach. He discusses his interview at Coastal, his subsequent work at Coastal from the early 1970s to his retirement in 2006. 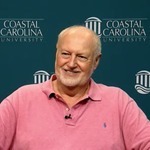 His 40+ year career at Coastal is expressed through the many campus and educational changes. Selwa, Daniel L. and Tomczyk, Charmaine B., "Daniel A. Selwa, oral history interview" (2018). The Coastal Carolina University Oral History Project. 6.